This synergistic diffuser assemby has extreme pumping ability and comes with a weighted base for easy installation in pond aeration. Efficient multi-airstone diffusers with the finest micro-bubbles available small ponds and koi ponds. 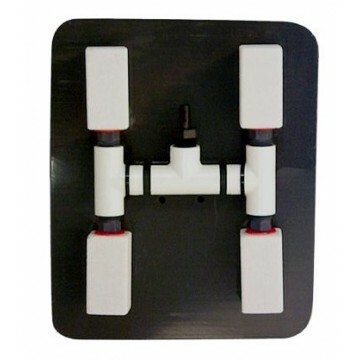 These diffuser assemblies are perfect for linear air pumps and small diaphragm air pumps! 4 Diffuser Manifold: 4 x 3" medium-pore airstones. Airflow 0.5 - 1.5 CFM. These weighted diffusers lay flat upon the l bottom so disturbed sediments is minimized and airstones do not become fouled or covered in muck due to the underlay which keeps the airstones out of the sediment. All assemblies are equipped with a 3/8" barbed connector for your 3/8" weighted airline. For larger ponds and lakes deeper than 10' use our large micro-bubble diffuser assemblies.